Sparkle Cat Rescue's Community Cat Project: Hayley's Fund needs donations to continue work in our community to trap-neuter-release cats to colonies where they have a caretaker willing to feed them and be sure they receive medical care in the future. We can't do this work without donations AND volunteers! The number of requests that come in daily are overwhelming and we hate we don't have the volunteers or funds to help every single stray/feral cat in our community! ​Our organization was founded on November 6, 2014, with a mission to save the 'forgotten felines': abandoned, abused, homeless, injured, neglected; and to educate the public on spay/neuter and TNR. Pictured is Hayley, who was rescued at just 4 months old with her 4 prematurely born kittens. Hayley was a stray kitten, born to a feral mom. She was severely malnourished, and at four months old too young to have kittens. She was just a kitten herself. Her babies were too tiny and Hayley was very sick and was not producing any milk to nourish her babies. Her babies all passed away shortly after we rescued the family. As of June 2017, Hayley is a healthy young girl who adores other kittens that are fostered with her at her foster home. Hayley asks for you to help other homeless cats that have no chance of being rescued because they are feral or rescues are full, and donate to her fund for spay/neuter and help prevent homeless kittens from being born. Sparkle Cat Rescue needs your support to help spay/neuter (TNR) cats. ​Spaying/neutering will decrease the number of kittens being born that may be trapped & taken to shelters by citizens who often deem them a nuisance, and where if deemed feral at a shelter they would be deemed unadoptable and humanely euthanized. If not deemed feral upon being surrendered to a shelter, the chances of cats and kittens becoming sick in the stress of a shelter environment can lead to them either dying from illness or being humanely euthanized. We receive 50-100 messages per week to take in kittens, pregnant cats, sick cats, stray cats. 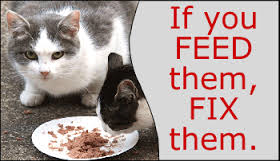 No one rescue can handle the volume of cats in our community that are homeless & need rescue on a weekly basis. TNR is the answer to help the stray/feral cats. It will reduce the numbers of cats & kittens going to shelters. It will reduce the number of homeless kittens being born that rescues are asked to take in and often unable to. The 2017 kitten season has been the worst we have seen. Without TNR we will see the number of stray/feral cats explode in our community. We will continue to see an increase in the number of kittens/cats trapped and taken to a shelter. By donating, you will be making a difference in the lives of the 'forgotten felines'. We are building a team of TNR volunteers who will work within our community to offer assistance and advice to those in need. Funding will be limited to strays and ferals and managed colonies. This will be an ongoing fundraiser, with our initial goal to be $5000.00 How many spay/neuters will $5000.00 cover? How about 111 spay/neuters (at $45 per cat, which includes a rabies vaccination).